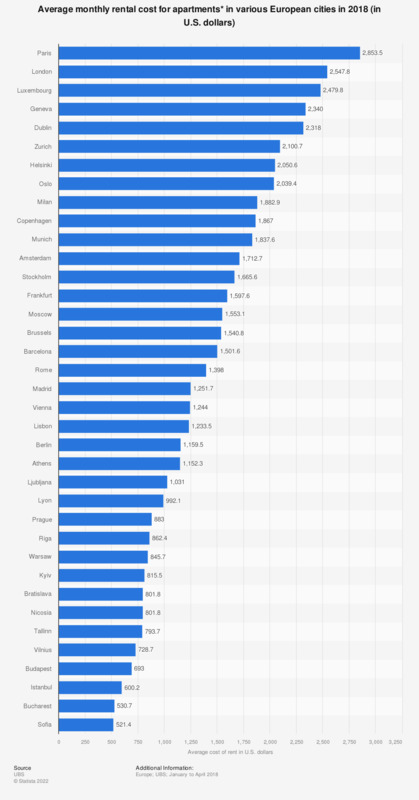 This statistic shows the average monthly gross rent, including the cost of utilities (energy and water) for an apartment in major European cities in 2018. Data as of 2018 showed that the most expensive monthly rentals happened on the housing market in the capital of France, with Parisians paying approximately 2.85 thousand U.S. dollars on average for their homes. Second in the ranking was London, with its inhabitants paying on average 2,547.8 U.S. dollars monthly for their rented accommodation. Overall, eight European cities had average monthly rental prices of over two thousand U.S dollars. * The source added the following "To estimate the worldwide costs of housing, we considered the prices for three different types of apartments. For two of these types, we standardized requirements to Western preferences, with a furnished two-room apartment and an unfurnished three-room flat. We only looked at newly built apartments with a bathroom and kitchen. Prices included utilities (energy and water taxes), but not the use of a garage. To capture local standards, our survey asked for the price of an apartment of typical size, location and amenities for the respective city. All three housing options were weighted equally."